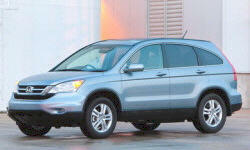 Why the 2010 Honda CR-V? I added: Rear Spoiler, splash guards, side body moldings & matching door guards. All of this equals a "head turning" vehicle. Handling is crisp and it is FUN to drive! I "feel" very safe in this car (has side air bags) and braking is excellent. Why Not the 2010 Honda CR-V? This vehicle rocks!! However, a higher driver position (of course) would be preferable. All Honda owners that I know LOVE their vehicle, and they all claim their next purchase will be another Honda. This is my first Honda and with only (500) miles on it, I have little, if anything to gripe about. I guess I wish I was getting at least 30 mpg with fuel prices so high and future prices will be even higher.